After publishing Torn in 2013, I was invited by a number of places to pop along and talk about my book, perhaps sell a few copies and do a bit of a signing. I trotted along, armed with a bag of copies of my book, some speech notes and few promotional bits and pieces like Torn bookmarks and so on. These weren't launches - we'd already done that to big fanfare. These were more of a Here's my book, this is what it's about and this is why I wrote it kind of thing. A few months later and I was still being invited places and doing the talk, posing for photos and signing books, and even though I'll always be very grateful for these opportunities, it was more of the same, over and over, and I admit, I started to wonder how many more times people would want me to answer the same questions, how many more times would they want to ask me the same questions. Don't misunderstand me, I'm terribly humbled by the attention I, and my book, have received, but that's just it - I didn't understand why little ol' me was getting all that attention in the first place. Skip forward to April 2014 and I've just released Inviolate and the round of interviews, photos and signings has started up all over again. Torn and Inviolate have attracted a lot of attention and have received amazing reviews. It's been a huge shock to me to realise that people are enjoying my books. I guess that's why I was unprepared for what happened a couple of weeks ago. 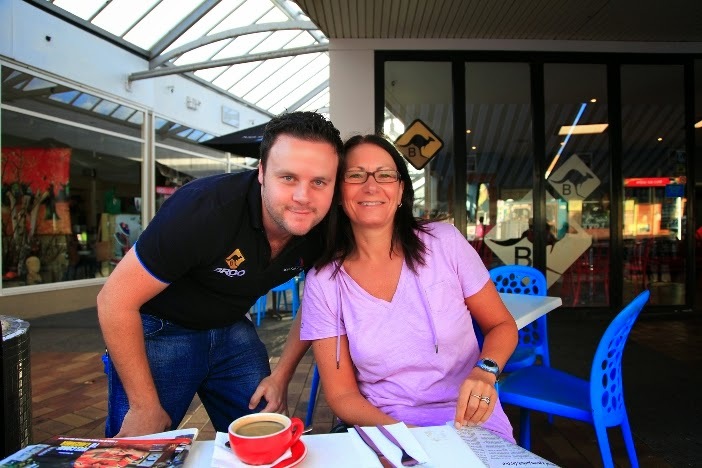 There's a cafe in Mornington where Stu and I often go for breakie called Main Sail Cafe Bar. The manager, Dave, asked me if I'd be prepared to do a little reading/signing event. For a modest entry cost, guests would receive a drink on arrival and all the finger-food they could eat during the evening. 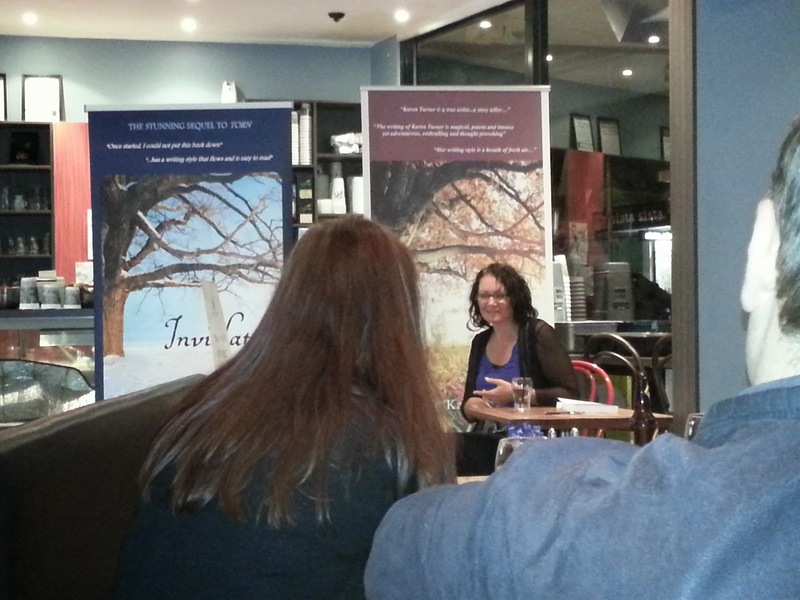 We'd planned to do the usual reading and signing, and I was prepared to wheel out my usual talk about my inspiration, the writing process and when the next book is coming out. But then an interesting thing happened. We had a poor turn-out. That's right, only about 20 people showed up. You could say that the weather kept people away - it was a typically freezing Melbourne winter evening and a lot of people who had originally said they were coming cancelled at the last minute due to a disgusting and very unsociable cold that was doing the rounds. In any case, it was a very small event. I wasn't used to this and my initial feeling was disappointment. But that quickly changed. Dave made his preliminary speech welcoming everyone, then went on to introduce me, and as I got up to speak a lady put up her hand and asked a question - not the usual interview question you get from newspapers or radio announcers. This was a question from a genuine fan of my books! I answered her question, gladly, and went to move on but suddenly another hand shot up with another question ... and this set the tone for the evening. These were people who had, for the most part, read Torn and were now keen to get a copy of Inviolate.Members of the audience shared their thoughts about my characters, other people asked questions about how factual were my accounts of the war and social customs of the era, and on it went. After about an hour of this, we wrapped it up and everyone continued to eat and drink and chat amongst themselves. Since that night, several people have contacted me to say how much they enjoyed the intimacy of the event and the very rare opportunity afforded them to ask questions of the author. This wouldn't have been possible at any other event! So, from being disappointed by the turnout, I did a complete one-eighty and decided that the evening had been a terrific success. My thanks to everyone who attended for your participation, and, of course, to Dave and Connor from Main Sail Cafe Bar for your ongoing support, and thanks to everyone who came along and participated. Here are a couple of pics for you. Dave and me at Main Sail Cafe Bar - shot taken last summer.